Nebula and Hugo Award nominees Daniel Abraham and Ty Franck-writing as James S. A. Corey-make theirStar Warsdebut in this brand-new epic adventure featuring Han Solo, Luke Skywalker, and Princess Leia Organa. The action begins after the destruction of the Death Star inStar Wars: Episode IVA New Hope.When the Empire threatens the galaxy's new hope, will Han, Luke, and Leia become its last chance?When the mission is to extract a high-level rebel spy from the very heart of the Empire, Leia Organa knows the best man for the job is Han Solo-something the princess and the smuggler can finally agree on. After all, for a guy who broke into an Imperial cell block and helped destroy the Death Star, the assignment sounds simple enough.But when Han locates the brash rebel agent, Scarlet Hark, she's determined to stay behind enemy lines. A pirate plans to sell a cache of stolen secrets that the Empire would destroy entire worlds to protect-including the planet where Leia is currently meeting with rebel sympathizers. Scarlet wants to track down the thief and steal the bounty herself, and Han has no choice but to go along if he's to keep everyone involved from getting themselves killed. From teeming city streets to a lethal jungle to a trap-filled alien temple, Han, Chewbacca, Leia, and their daring new comrade confront one ambush, double cross, and firestorm after another as they try to keep crucial intel out of Imperial hands.But even with the crack support of Luke Skywalker's x-wing squadron, the Alliance heroes may be hopelessly outgunned in their final battle for the highest of stakes: the power to liberate the galaxy from tyranny or ensure the Empire's reign of darkness forever.Praise for Honor Among Thieves"If you like Han Solo . 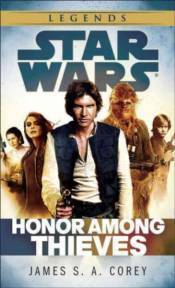 . . you won't want to miss Honor Among Thieves.. . . A novel that flies by quicker than theMillennium Falconon the Kessel Run. "-Lightsaber Rattling"A fast-paced romp. "-Big Shiny Robot"Honor Among Thievesfelt very 'vintage.' . . . It nailed the classic Star Warsvibe in a way I haven't experienced in a long time. "-Making Star Wars"One of the best Star Warsnovels I've ever read. "-Knights' Archive"Absolutely [captures] the magic of Star Warsand the era it's aiming for. "-Jedi News(UK)"[The] most pleasurable 'Classic Trilogy' Star Warsreading in a long time . . . With masterful pacing and witty, descriptive dialogue, [Honor Among Thievesis] fun to read from start to finish. Adding a complexity of thought and action to a classic character like Han will satisfy those looking to indulge a deeper side. "-TheForce.net"James S. A. Corey manages to tell a delightful tale filled with a fun plot, entertaining characters, and great descriptions that draw you in and bring the world to life. Fans of all sorts are sure to enjoyEmpire and Rebellion: Honor Among Thieves. "-EUCantina.netFrom the Hardcover edition.